Captain! We're taking on water! We have to submerge! Up periscope! Dive! Dive! Now, when was the last time a rain shower offered you that much excitement? With this sunny yellow umbrella, every rain cloud offers a return to childhood adventure - without even messing up your big-girl style. The dome of the umbrella reaches down extra far, shielding your hair and makeup from the evil forces of wind and rain. A scuba goggle-shaped window helps you navigate safely through shoals of treacherous pedestrians. Then, when you've reached dry land, the periscope has a slip-resistant, rubberized surface that makes it easier to lean the umbrella up against a wall. Made in China. 33.5" L x 5.5" W x 1.4" H ; 14 oz. Have not used it yet, just waiting for the next storm. I wanted a humorous gift for my adult daughter and she was pleased with it. The umbrella seems cheaply made and is a little difficult to open. The deep dome and the goggles-window were appreciated. I meant it for a laugh and I think she will like it. I don't expect it to last long. The little fake periscope on the tip is dopey rather than funny. Very bright cute umbrella. My child loves it, but it is a little difficult to open and close. My college aged daughter absolutely loves this umbrella. It was among her favorite Christmas gifts. It's brightly colored, very unique, and makes carrying an umbrella a fun event. The product is wonderfully designed with a great sense of imagination. 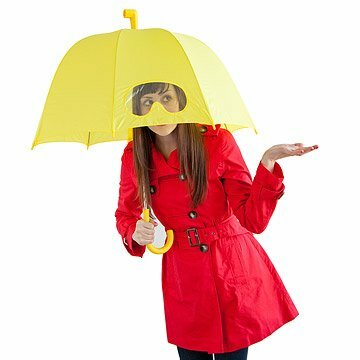 The yellow umbrella not only stands out - which is great if the user constantly makes a mess or wants to stand out in a crowd - due to its bright color, but it also has a clear portion for goggles. The umbrella is long enough to protect one's face from any weather. It is overall ingenious and resourceful. I loved the bright yellow color, the little clear goggles window is perfect! This was a gift for my teenage daughter and she just loves it! This sunny yellow umbrella has an extra deep dome, a window for better visibility, and is topped with a yellow periscope.